custard recipe is very to easy to make. this custard recipe is a basic vanilla custard sauce made without eggs and without custard powder. custard recipe with step by step pics. 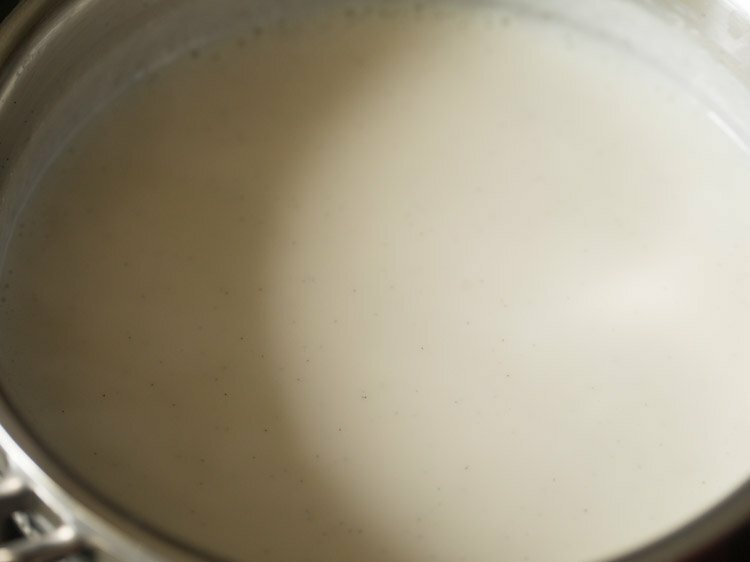 one of the easiest sauce that can be made quickly is custard. 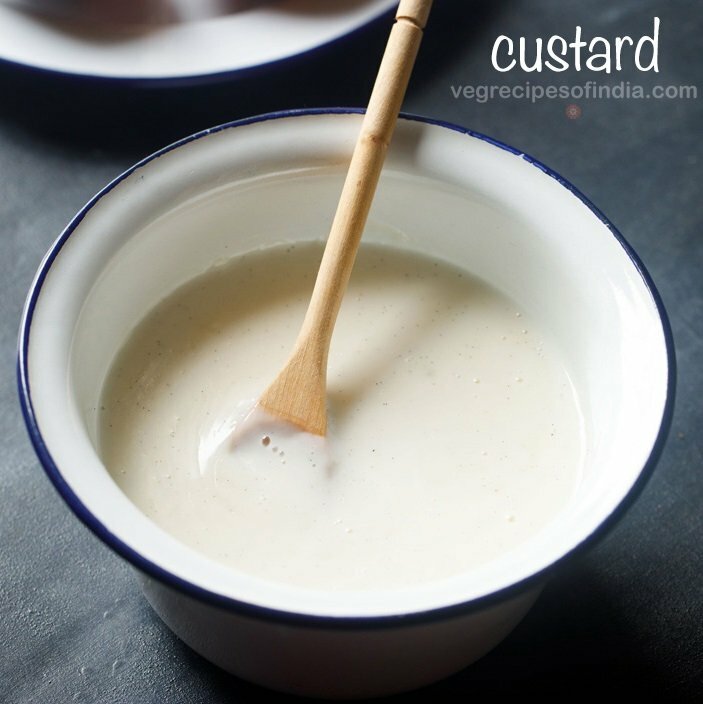 in this recipe post, i am sharing a basic vanilla custard sauce made without eggs and without custard powder. custard is a creamy sauce generally made with milk, eggs and sugar. eggs are used to thicken the sauce. the consistency of custard can be of a pouring consistency to a thick or firm consistency. custard can also be made without eggs. in an egg free custard recipe corn starch is used as a thickening agent in place of eggs. corn starch is white coloured flour extracted from the endosperm of corn kernels. 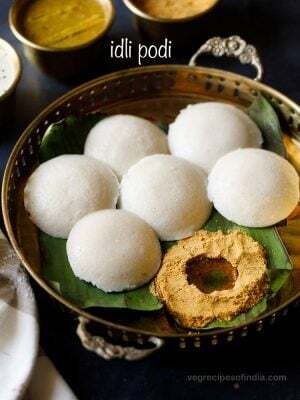 its also called as corn flour in india. what are the types of custard and its uses? custard can be both sweet and savory. though mostly sweet custard sauce is made. how is eggless custard made? 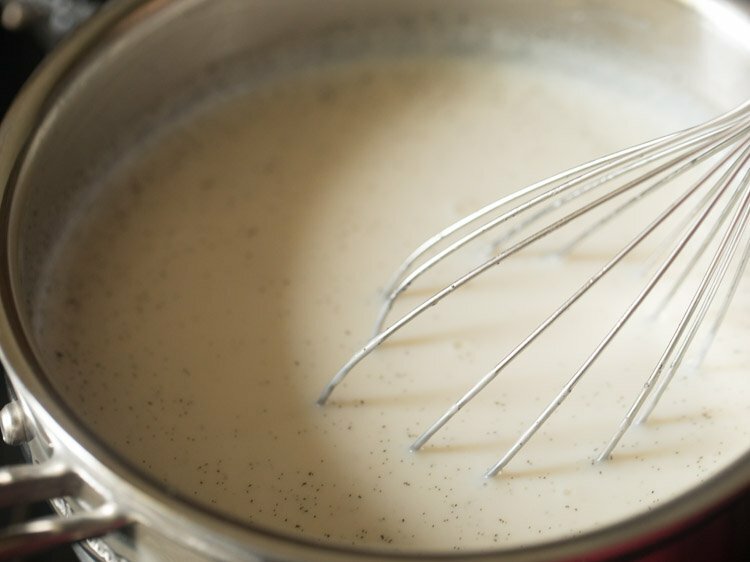 to make eggless custard all the ingredients like milk, sugar and corn starch is mixed and slowly simmered on a low flame till the sauce thickens. the consistency of custard can be made thin or medium or thick by altering the proportions of milk or custard powder. making custard is very easy. just remember to cook the custard sauce mixture on a low flame and stir gently. in place of corn starch you can even use custard powder. though i have used corn starch as thickener. you can even use custard powder, rice flour, arrow root flour, potato starch, tapioca starch as thickening agents. 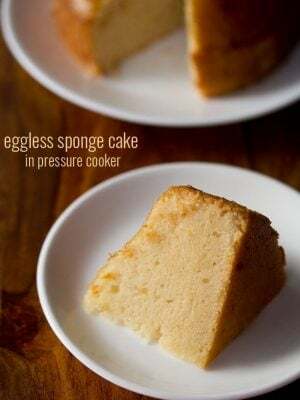 this recipe is very helpful if you do not have custard powder. custard powder is nothing but corn starch mixed with a few flavoring and coloring agents and preservatives. when making custard with eggs, there may be a possibility of the sauce getting curdled. this recipe is fool proof as there is no way curdling can happen in the custard sauce. moreover you don’t need a double boiler to make this eggless custard. you can keep the pan directly on the stove top and cook the custard sauce. how to make a vegan custard? for vegan custard, use almond milk. i have made both custard and white sauce with almond milk earlier. 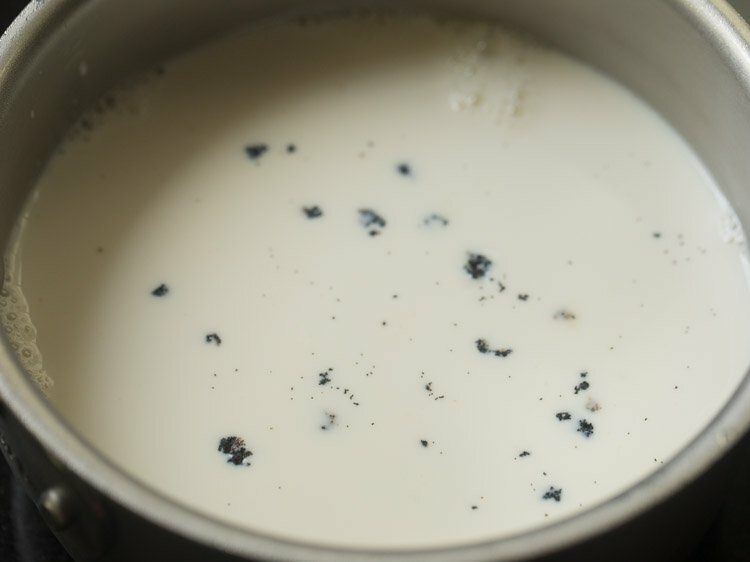 while cooking with almond milk, do simmer it on a very low flame. just gently heat and do not let the almond milk come to a boil. for a thicker and firmer custard, add more corn starch than what is mentioned in the recipe. you can add 1 to 2 tablespoons more. 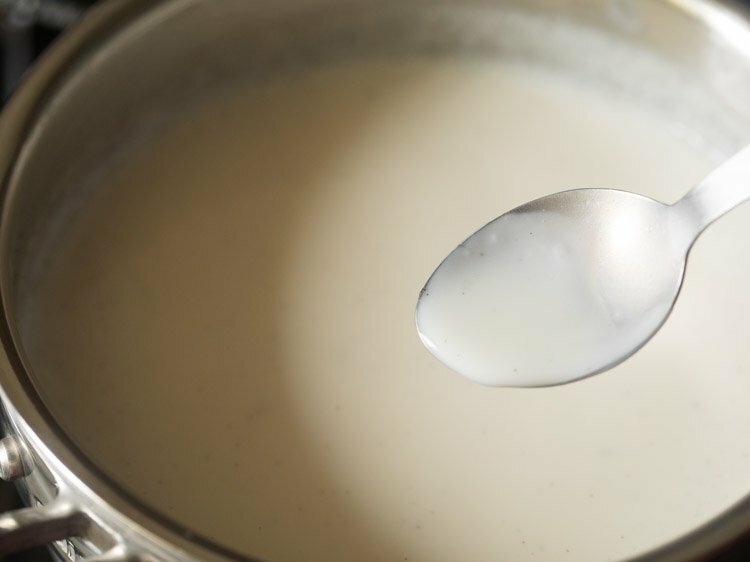 instead of adding more corn starch, you can also add reduce the quantity of milk and make a thick custard. 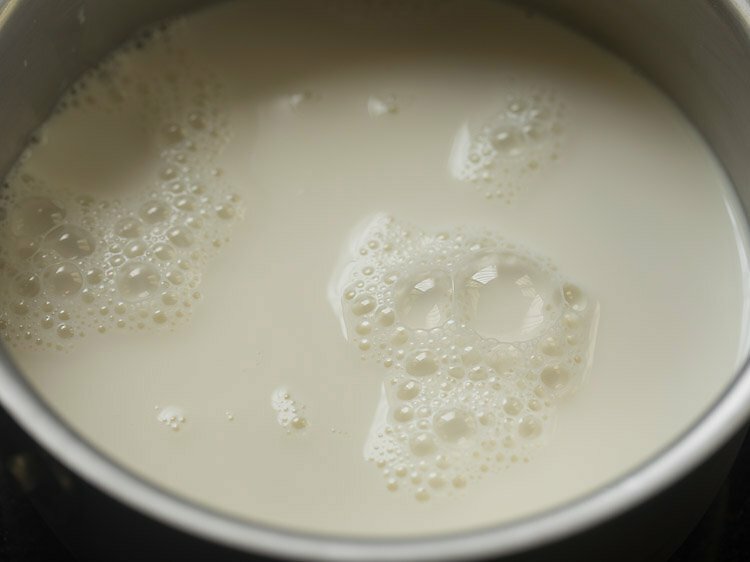 you can use both whole milk or toned milk to make custard sauce. 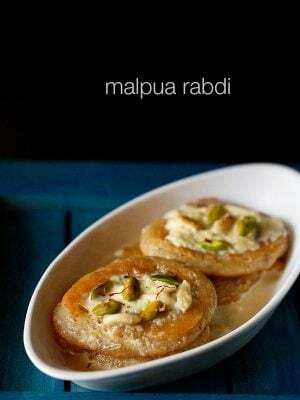 if you do not have vanilla, you can use cardamom powder or cinnamon powder and even a bit of nutmeg powder. while cooking, simmer gently on a low or medium-low flame. 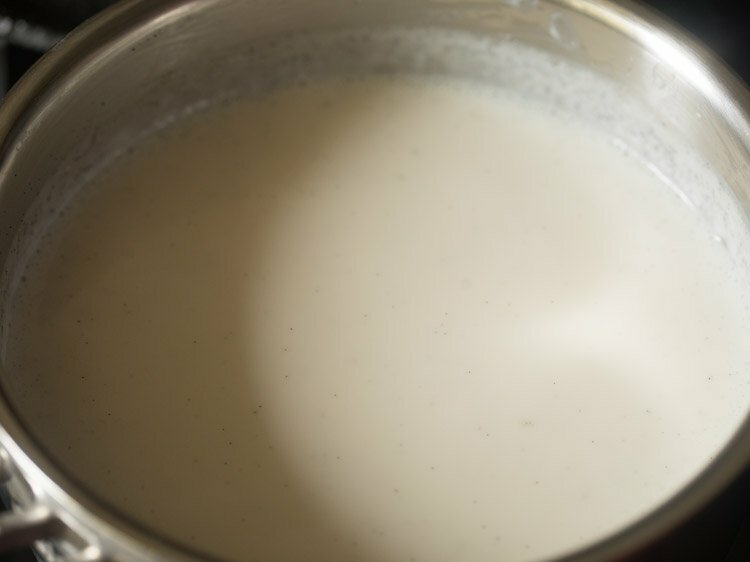 stirring often ensures that the custard sauce does not stick to the bottom of the pan. also do use a good quality steel pan, so that the custard sauce does not get browned or burnt from the bottom. after the custard cools down at room temperature, you can refrigerate it. if making fruit custard, then just before serving, mix the fruits in the chilled custard. you can even make fruit based custard sauce. make custard and let it cool. then add fruit purees like mango puree, apple puree or apple sauce, banana puree, strawberry puree etc to the sauce. mix and refrigerate. 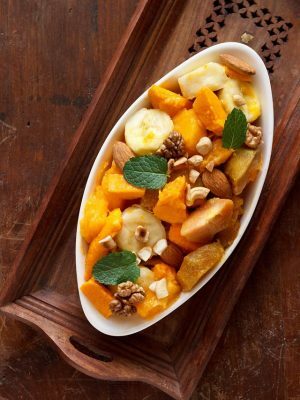 when using fruits, especially very sweet fruits, reduce the amount of sugar in the basic custard sauce recipe. chocolate custard pudding can also be made by adding melted chocolate which has been cooled in the custard sauce. another option is to add cocoa powder initially and cook the custard sauce till it thickens. later refrigerate for the chocolate pudding to be set. custard is one of those recipes, i had learnt very early in life in my home science cooking classes. we were expected to make a flawless custard and yes we did make it really well and perfect. i make custard sauce to make recipes like fruit custard, trifle, bread & butter pudding etc. 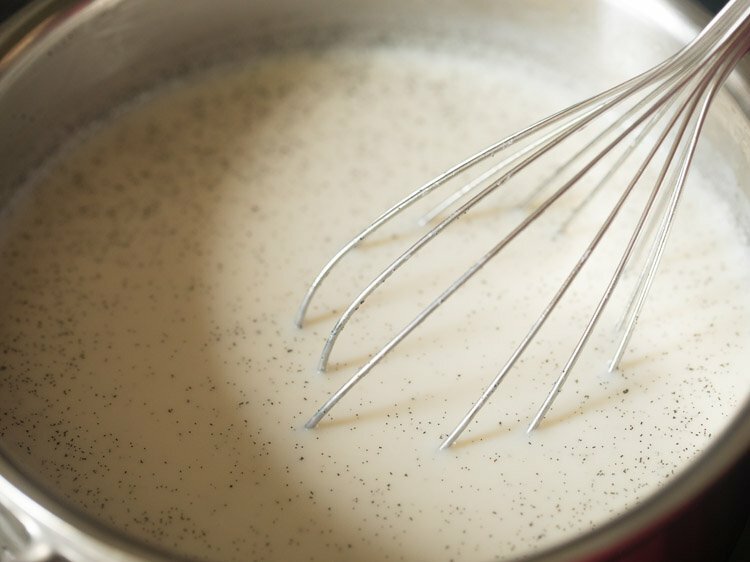 so since i have been making this custard sauce for a very long time, i thought of sharing the method. 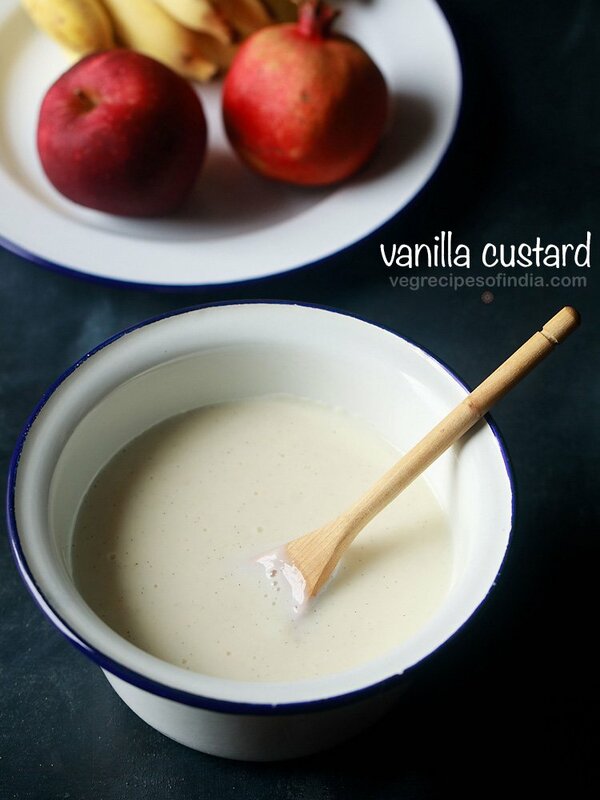 with this custard sauce, i had made fruit custard and baked custard. 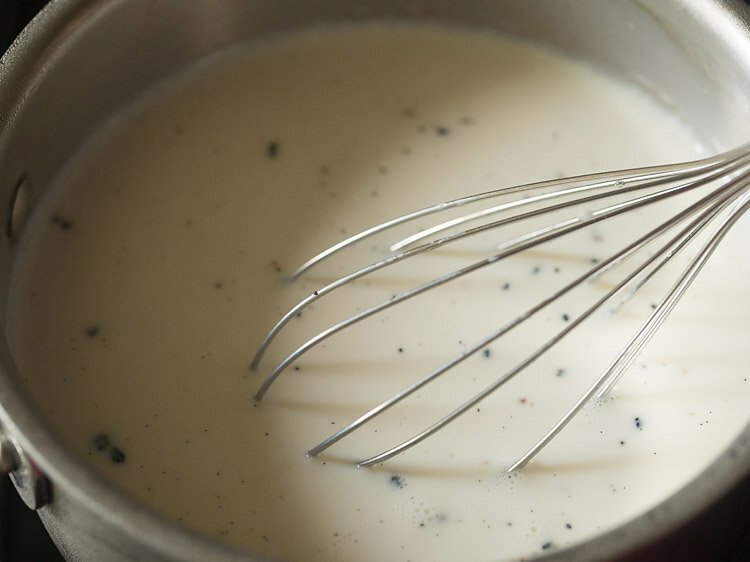 personally we love the flavor of vanilla in a custard sauce. so if using vanilla, i would highly recommend to use vanilla beans or a pure vanilla extract. 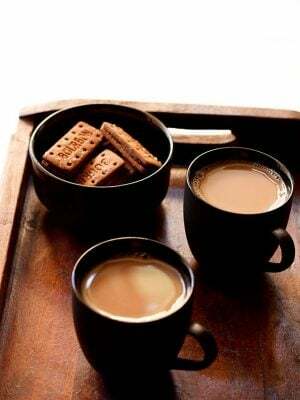 even artificial vanilla essence gives a good aroma, but for the real deal please use vanilla beans or vanilla extract. you can have this basic custard sauce plain. add some fruits in the sauce and you get a fruit custard. 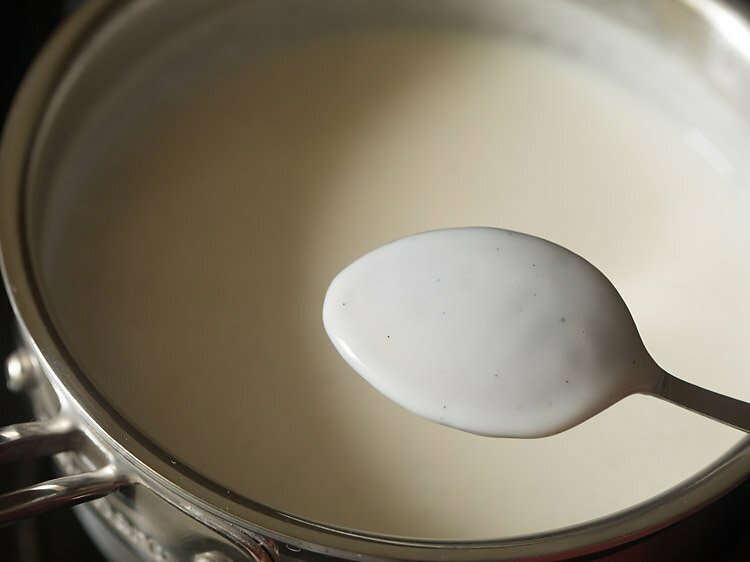 caramel pudding, bread and butter pudding, baked custard, trifle etc can also be made with this custard sauce. in a heavy sauce pan take 3 cups milk. 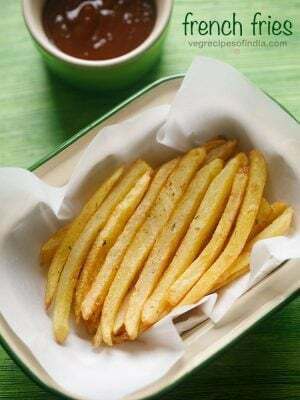 add ¼ cup corn starch and 8 tablespoons sugar or add as per taste. next add 1 teaspoon vanilla extract or ½ of a vanilla bean, scraped. mix everything and keep the pan on stove top on a low to medium-low flame. 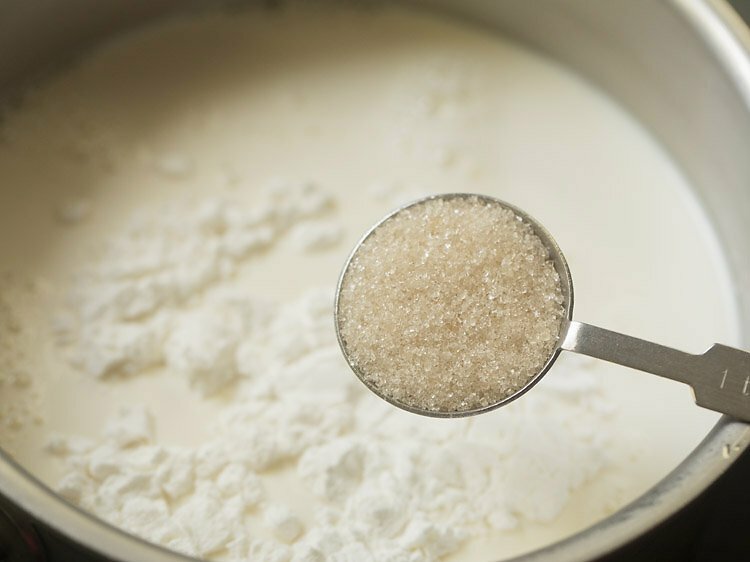 stir so that all the sugar dissolves. use a wired whisk for ease of use and best results. simmer on a low to medium-low flame. 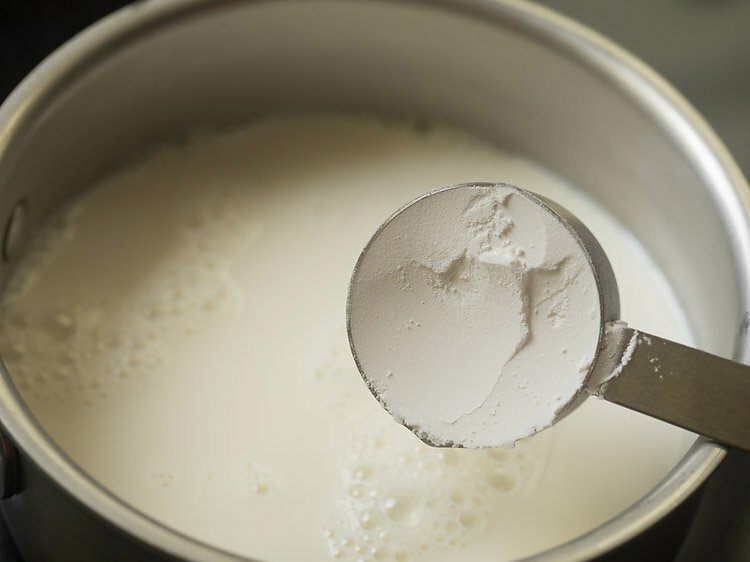 when milk gets hot, then stir often so that the custard mixture does not stick to bottom of pan and forms lumps. continue to stir till the custard sauce starts to thicken gradually. do remember to cook on a low to medium-low flame. so do not rush. you don’t want a lumpy custard or a browned or blackened custard. the sauce will thicken. continue to simmer and stir continuously till the sauce thickens more. take the sauce in a spoon and it should coat the back side of the spoon. switch the flame off and cover the pan with cotton kitchen towel or napkin. placing a cotton kitchen towel reduces from forming the layer of skin on top. let the custard sauce cool at room temperature. later you can keep in fridge. do note that on cooling the sauce will thicken more. you can use this custard sauce to make desserts like fruit custard, bread & butter pudding, baked custard, trifle etc. 1. in a heavy sauce pan take 3 cups milk. 2. add ¼ cup corn starch. in india we call corn starch as corn flour and it is a white colored flour. 3. add 8 tablespoons sugar or add as per taste. 4. next add 1 teaspoon vanilla extract or ½ of a vanilla bean, scraped. i have used vanilla bean. 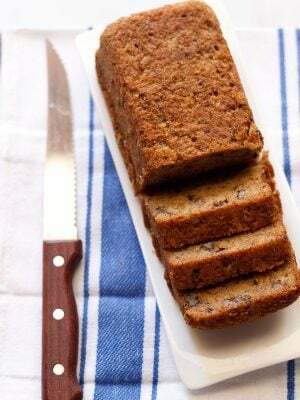 if using vanilla essence, then add ½ teaspoon of it. 5. mix everything and keep the pan on stove top on a low to medium-low flame. 6. stir so that all the sugar dissolves. use a wired whisk for ease of use and best results. 7. simmer on a low to medium-low flame. 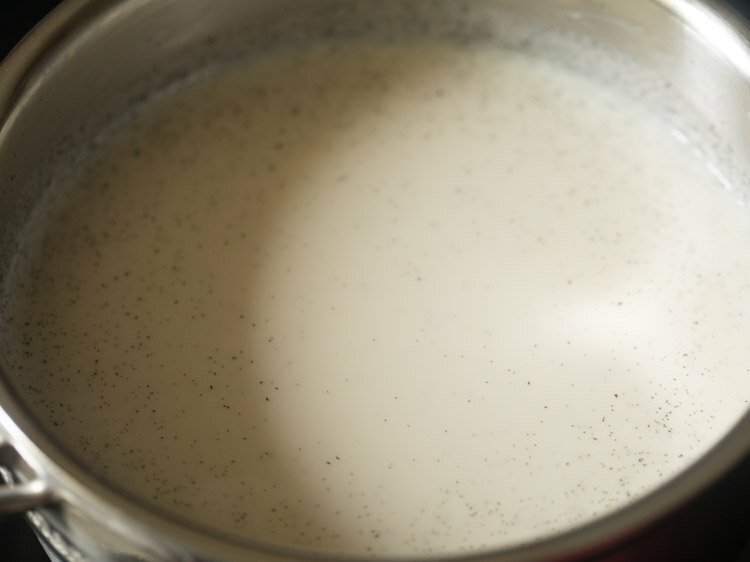 8. when milk gets hot, then stir often so that the custard mixture does not stick to bottom of pan and forms lumps. 9. continue to stir till the custard sauce starts to thicken gradually. 10. do remember to cook on a low to medium-low flame. so do not rush. you don’t want a lumpy custard or a browned or blackened custard. 11. the sauce will thicken. 12. continue to simmer and stir continuously till the sauce thickens more. 13. take the sauce in a spoon and it should coat the back side of the spoon. 14. switch the flame off and cover the pan with cotton kitchen towel or napkin. 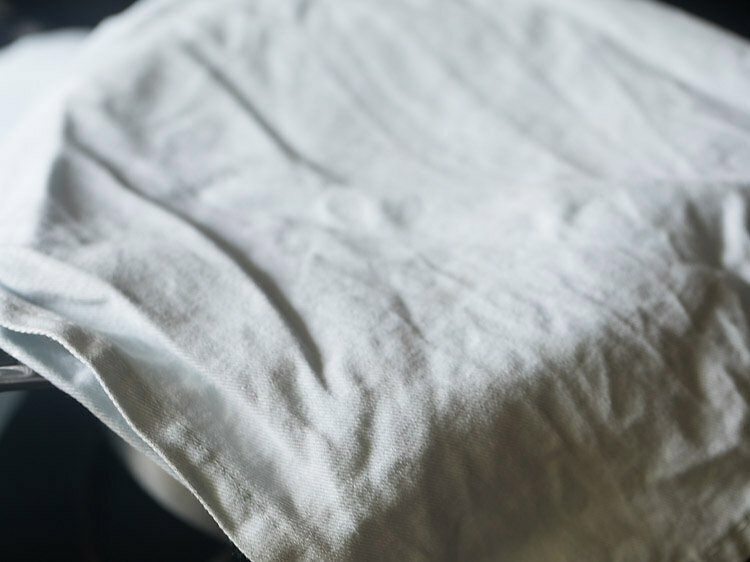 placing a cotton kitchen towel reduces from forming the layer of skin on top. 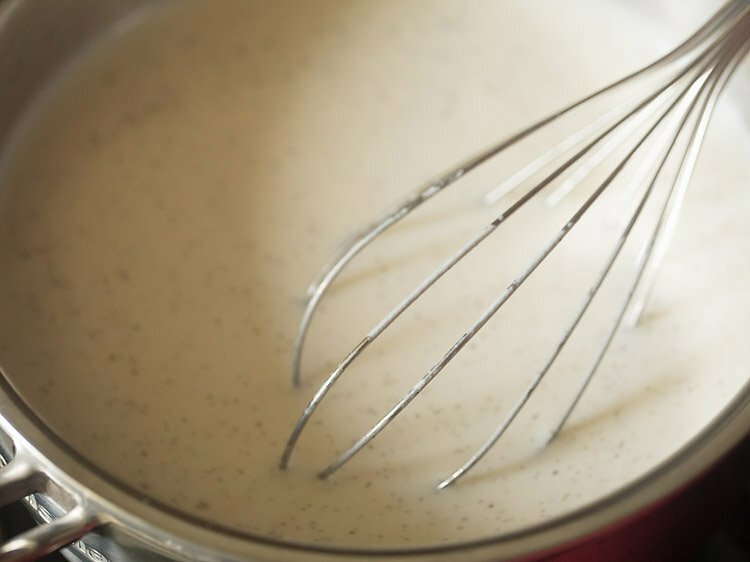 let the custard sauce cool at room temperature. later you can keep in fridge. do note that on cooling the sauce will thicken more. 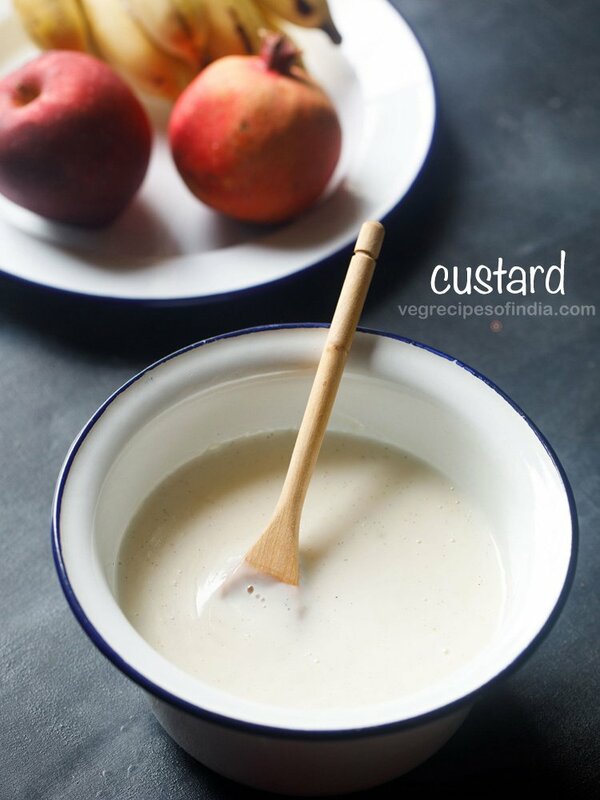 15. you can use this custard sauce to make desserts like fruit custard, bread & butter pudding, baked custard, trifle etc.